I can not believe that Halloween is right around the corner. If you are a mom with kids in elementary school then you are probably scrambling trying to figure out something to do for the classroom party…am I right? 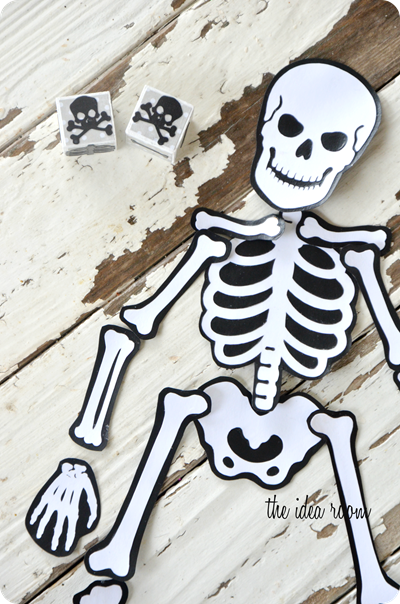 Last year we played this cute version of Halloween Bingo from my friends over at The Crafting Chicks. This year my daughter is a “grown-up” 5th grader and requested a different game. So I decided to come up with a new game. 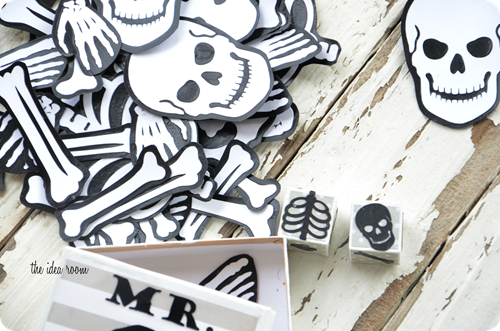 And thus we have one of our newest Halloween games…Mr. Bones. I used my Silhouette Cameo machine and purchased one of their position-able skeleton images from their online shop for $1. Then I cut several of them out on white cardstock. Then took each one and glued them onto black cardstock and Mod Podged them up real good (nice grammar). 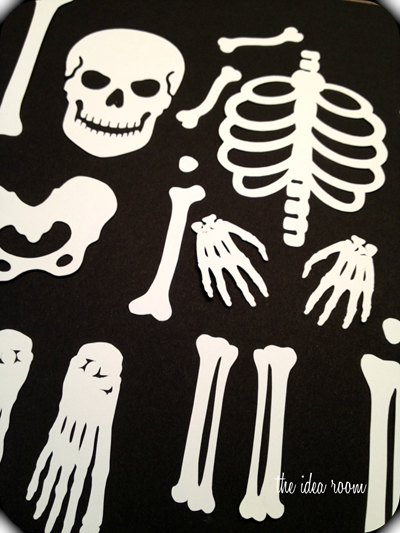 After they dried, I cut them out into individual skeleton parts. You will need one whole skeleton per person playing the game. To make the dice, I just got two wooden blocks (1 inch in size) and painted them white, Mod Podged on some fun gray polka dot scrapbook paper an then added some really small skeleton parts that I cut out in black cardstock. 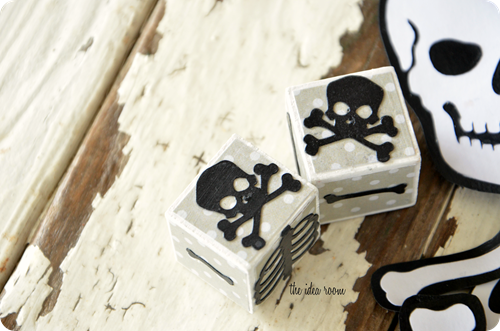 Re-coat the entire dice with Mod Podge and let dry. 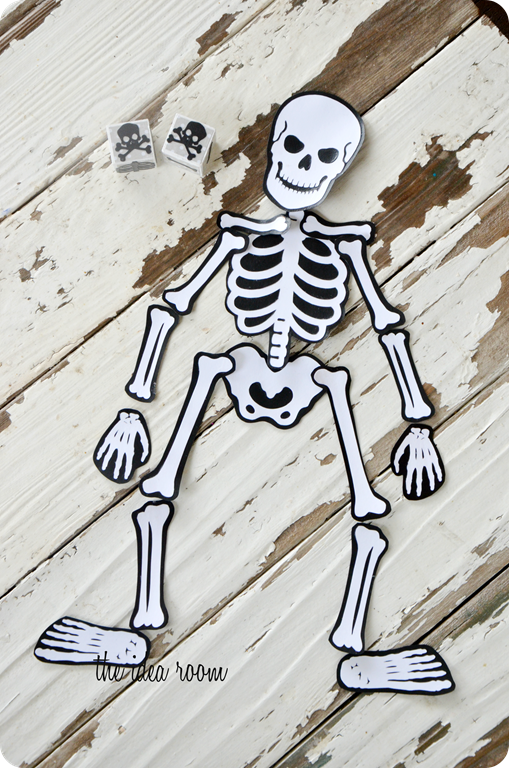 Important: You will need a different skeleton part represented on at least one side of the dice. For example: you will need a skull, rib cage, clavicle, upper arm, lower arm, hand, pelvis, upper leg, lower leg, and a foot. That is 10 body parts and my skeleton had 10 body parts. That meant that I had two open spots on my dice. So I added a skull and crossbones. The skull and crossbones then become a fun twist to the game, which I will share in the rules of the game below. For the game box I used a simple brown craft box which can be found at most craft stores. I painted it white and then added some gray striped scrapbook paper. Then I made the name out of some Iron-On Fuzzy Transfer from Silhouette. The general goal of this game is to see who can build their skeleton first. Set out the pile of bones in the center of the table. Each player will take a turn rolling both dice. The skeleton parts on the dice are the parts you will be able to grab from the pile to build your Mr. Bones. 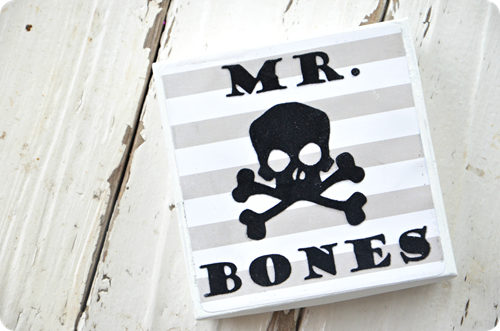 If you roll one skull and crossbones this allowed you to take a bone from an opposing player. 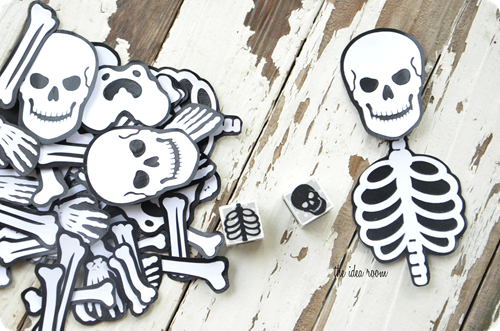 If you roll two skull and crossbones, you had to return ALL of your bones to the pile in the middle and start over. The first player to build their entire Mr. Bones wins. That’s all there is to it. It is pretty simple and you can change it up too depending on the age of kids you are going to be using it for. As a science teacher you could also add the scientific names to the dice rather than the picture to help your students learn the names of the bones. If your kids are younger and need help knowing where the skeleton bones need to go, you can print out a full skeleton on a sheet so the kids can look and see just where each bone needs to go. I did this for my two younger kids when we played this for Family Night the other day. My kids LOVED this game and my daughter is excited for me to bring it to her class party next week! What do you think? 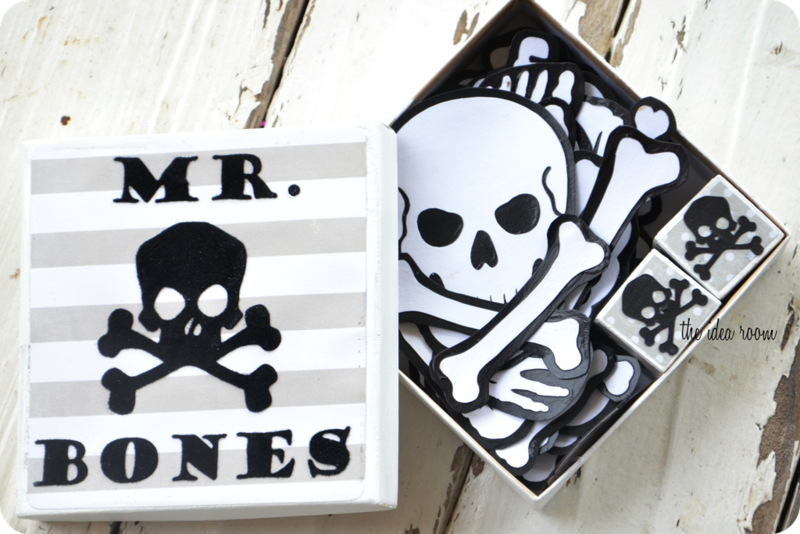 As always, I would love to see if any of you end up making your own Mr. Bones game. Great game Amy. Just one question. If you roll the dice and get parts you already have, do you just move on to the next persons turn? Yes. You lose a turn and the next player goes. Super cute game Amy! Love it. Thank you! I was JUST sitting down to search pinterest for something to do at the class party :) seriously!! i checked my email first and found this fun game in my inbox :) I will let you know how it goes!! Wonderful game! I’m doing this with my kids! What a fabulous idea for those “tweens” that are teetering on the edge of being “too cool” for classroom parties. haha! I do have a couple of those “tweens” who fit that bill perfectly! Thanks so much for stopping by! Asking questions are genuinely pleasant thing if you are not understanding anything fully, except this piece of writing provides good understanding even. This is really cute. 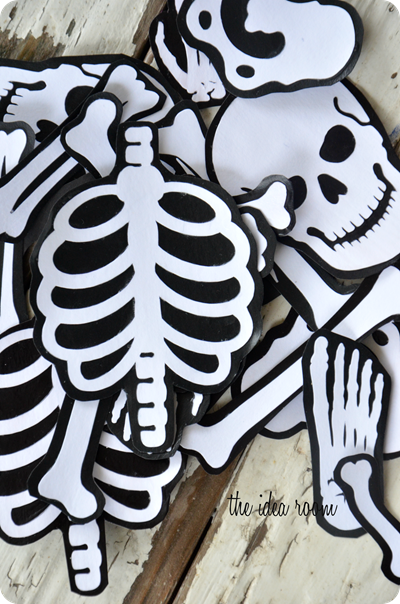 Is it possible for you to share the skeleton printable or tell me where you found it. I would love to do this for my book “Dem Bones”. Thank you for sharing your amazing ideas. We do a “mad scientist” party instead with hands on science experiments at each station. Too many families who do not celebrate Halloween or El Dia De Los Muertos either.